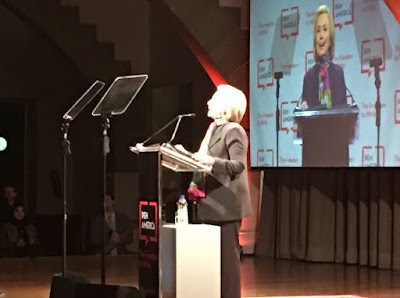 I was at Cooper Union - the location of one of Lincoln's most famous speeches to see Hillary Clinton deliver the Arthur Miller Freedom to Write Lecture for Pen America. Both the PEN official who introduced Clinton and Clinton herself referenced Lincoln's speech, which was a good idea. It was apparently an amazing speech and is given credit for Lincoln's successful presidential campaign. An eyewitness that evening said, "When Lincoln rose to speak, I was greatly disappointed. He was tall, tall, -- oh, how tall! and so angular and awkward that I had, for an instant, a feeling of pity for so ungainly a man." However, once Lincoln warmed up, "his face lighted up as with an inward fire; the whole man was transfigured. I forgot his clothes, his personal appearance, and his individual peculiarities. Presently, forgetting myself, I was on my feet like the rest, yelling like a wild Indian, cheering this wonderful man." The text of Lincoln's speech is available online of course, and well worth the read as I discussed on this blog some years ago. I would really love to find a video deliver this speech with the barn-burning delivery I think it deserves. I found Sam Waterson giving the speech, but I don't think he does it justice. If only I could hire Daniel Day Lewis. I doubt anybody could top Lincoln, but Clinton's speech is very good and she got off quite a few zingers against Trump. You can watch it here. Everybody in the room of course would have preferred that Clinton joined the presidential brotherhood instead of Trump, but there is a sort-of connection between Clinton and Lincoln - she gave the Arthur Miller Lecture. Miller's daughter is married to Daniel Day Lewis. I love him, so much in Lincoln. Tony Kushner wrote the screenplay and this first scene from the movie strikes me as the most Kushneresque of them all. Lincoln (2012) – Opening Scene from LYNN MADSEN'S VIDEOS on Vimeo.